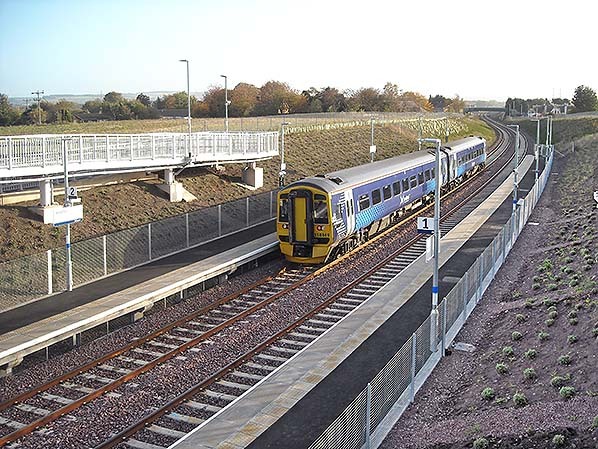 Notes: The Borders Railway from Edinburgh to Tweedbank follows the trackbed of the former Waverley Route with a minor readjustment at Galashiels, but between Eskbank and Newcraighall the railway follows a new route. This entirely new alignment has been constructed to enable the planned new town of Shawfair to be served, and its station has already been provided. The original Waverley Route passed through Millerhill station. The £200 million urban development project at Shawfair was mooted in 2005 and a residential and commercial centre with around 4,000 new homes, two primary schools, a secondary school and one million sq ft of commercial and retail space are envisaged. The 700 acres of the new town (a little over a square mile) will include the site of the former Monktonhall Colliery (mothballed in 1987 and closed in 1997). This is not the first proposal to regenerate former industrial land in the vicinity; in the late 1980s there was a proposal by Heart of Midlothian Football Club to build a new stadium at Millerhill to replace its Tynecastle stadium in Edinburgh, which eventually foundered. In 2015 there is little to see at Shawfair apart from its station standing amidst fields, but it is approached by a spur road from the A6106, about a quarter of a mile in length, and is equipped with a car park for about 60 vehicles. 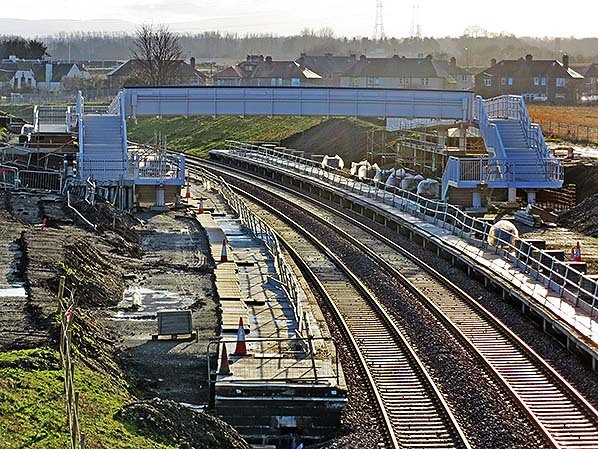 This far-sightedness is in stark contrast to the budgetary stringencies which condemned the Borders Railway to be largely single track and for some bridges to be built at only single-track dimensions. 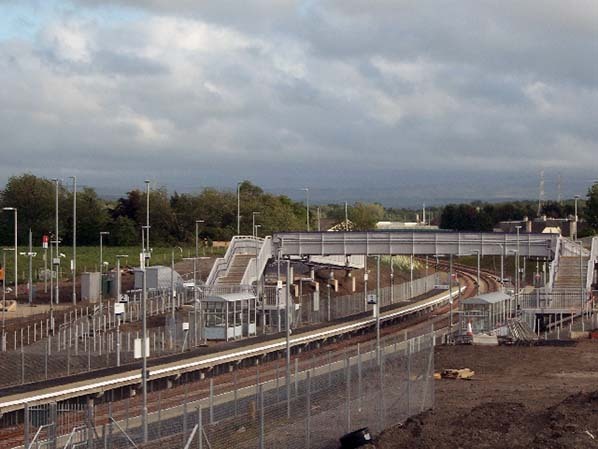 Shawfair station is on a double-track ‘dynamic loop’ of 2 miles 9 chains between King’s Gate Junction and Newcraighall South Junction. 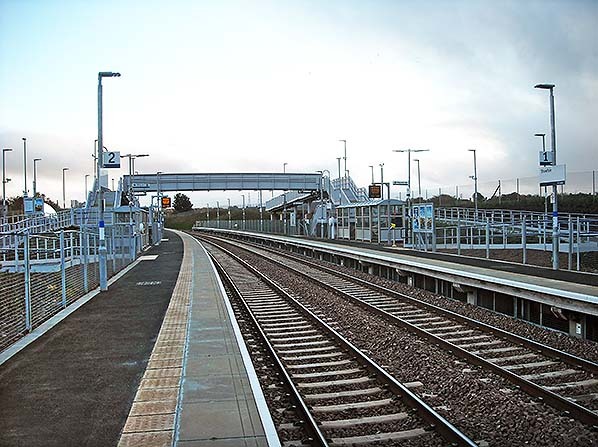 Apart from Stow it is the only one of the nine Borders Railway stations to have two separate platforms – Tweedbank has an island with two platform faces. Shawfair’s platform layout requires a large ramped footbridge. It is ironic that this station, so extravagant in appearance, is likely to be one of the least used on the line until such time as the new town becomes a reality. Visiting the station on two successive weekday afternoons in late October 2015 the author counted fewer than ten cars parked at the station, and no passengers were seen to join or alight from the few trains he saw calling. The fixtures and fittings at Shawfair station are typical of those on the Borders Railway. Glazed metal waiting shelters are provided for passenger comfort, and there are automatic ticket-issuing facilities, CCTV surveillance, and train information is conveyed by a public address system, digital display screens and posters. Sheltered storage for 20 bicycles is available. In order to accommodate the extension the original terminus at Hawick was closed (becoming the town's goods station) and a new through station was built on a new alignment to the south, taking the line on a viaduct high above the River Teviot. Beyond Hawick the line passed through difficult terrain requiring heavy engineering works, with steep gradients and viaducts (notably the magnificent 15-arch structure near Shankend) before reaching the 1208 yd summit tunnel at Whitrope, 1006 ft above sea level. The new community at Riccarton, 1½ miles from the nearest road, had no doctor, so a light engine was kept permanently in steam at Hawick to convey emergency services to the village when required. Initially Sunday worshippers used the engine shed, then the waiting room, a minister walking from Saughtree on the Border Counties line to officiate at the services. Eventually church trains were provided to take worshippers to Newcastleton and Hawick on alternate Sundays.As the Borders Counties line was already open, Riccarton opened early, before all the railway facilities were completed. The line continued south through open country before reaching Newcastleton, the first community of any size since leaving Hawick, 21 miles to the north. Three miles further south the line crossed into England at Kershopefoot. A further six miles south was Canobie Junction (later to become Riddings Junction), the junction for the Langholm branch which opened to Canobie (later called Canonbie) in May 1862, and to Langholm on 14 April 1864. The expresses were limited-stop, and in the 1950s they covered the mileage from Carlisle to Edinburgh in roughly two-and-a-half hours. Motive power was usually in the form of a Gresley A3 Pacific locomotive, a class unsuited to hill climbing. With large driving wheels and three cylinders they were designed for running long stretches in excess of 80 mph on heavy expresses; however the 'Waverley' express was typically eight coaches in length, and speeds on the Waverley Route were limited to 70 mph, and the many tight curves required more severe speed restrictions. On the climb from Newcastleton to Whitrope Summit the train would be down to 30 mph by Steele Road, with the locomotive being worked flat out. Other passenger services (usually three per day) were also worked by A3s, although Thompson B1 4-6-0s made regular appearances. There was also a daily Gresley A4 diagram between Edinburgh and Carlisle - an overnight fitted freight southbound, returning with the early morning parcels train. Thompson Pacifics appeared later on, just before the line was dieselised, in a drive for efficiency. In addition there were also several local passenger workings between Galashiels and Edinburgh (some via the Peebles loop, which opened in stages between Galashiels and Eskbank between 4 July 1855 and 1 October 1864) and between Hawick and Carlisle. These tended to be hauled by B1s. Track-lifting had begun, but was temporarily halted in early 1969 while British Rail negotiated with a private consortium, the Border Union Railway Company, to discuss buying the infrastructure. Various options were put forward to keep the route open such as singling large sections of the track and reducing the number of signal boxes; however this came to nothing, and British Rail ceased negotiations on 23 December 1969 after requesting hefty interest payments to keep the infrastructure 'in situ' while funding of the required £1 million capital was sought.An inspection saloon ran over the route in early 1970 to allow contractors to bid for the demolition work. Track-lifting started in earnest, and trains could be seen from time-to-time on the route undertaking dismantling duties. The down line between Hawick and Longtown was lifted by 1 April 1972, the up line having been lifted by February 1970. The entire route between Longtown and Newtongrange was removed by early 1972. The final stretch from Newtongrange to Millerhill was closed on 28 June 1973 and removed soon after. In the late 1990s there was some discussion about reopening the southern section from Carlisle as far as Riccarton Junction. Trees in the afforested area surrounding Kielder were approaching maturity, and the significantly increased logging traffic threatened to congest the narrow roads and inconvenience the local population. Reinstating a single track was seen as an option to provide transport capacity for heavy loads, bypassing the villages, but the project was not pursued. Tickets from Michael Stewart, Bradshaw from Chris Totty, route map drawn by Alan Young. Looking south at Shawfair station in August 2014. The platforms have been built the rest of the station site is still very much a work in progress. A start has been made laying the ballast between the platforms. A bulldozer just seems to have stopped mid-task at knocking off time. Shawfair station looking south from the new road bridge in early January 2015. Looking south at Shawfair station in June 2015, four months before the station opened. Looking north from the footbridge at Shawfair station on 22 October 2015. 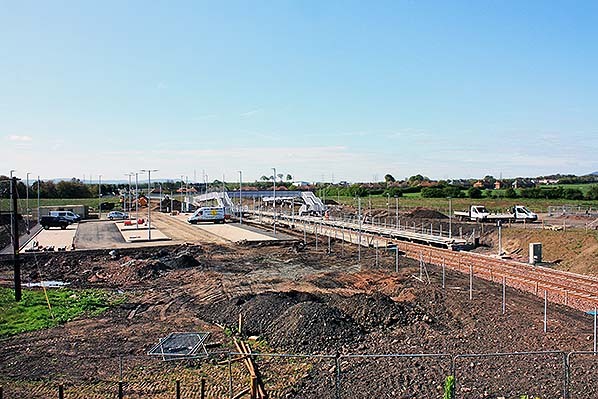 The bridge in the background carries the new road from the A6106 (out of sight to the left) to the station, where it currently ends. Late-running Class 158 DMU 158 727 is the 16.08 departure for Edinburgh; it is leaving Platform 1 having conducted no business at the station. Looking south along Platform 2 (southbound) at Shawfair on 21 October 2015. The glazed metal waiting shelters and train departure screens seen here are standard features of the Borders Railway stations. The ScotRail nameplates leave plenty of space after the name ‘Shawfair’ for later additions, perhaps in the form ‘Home of ….’ which is now found at many British stations. 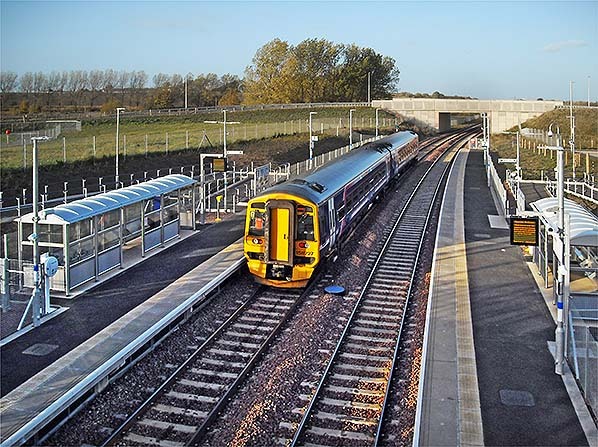 The scene is dominated by the lengthy ramps required to make the station ‘accessible’ and which probably accounted for a large proportion of the cost of construction. Note the absence of passengers. Shawfair station looking south-west across the car park on 21 October 2015. The car park can accommodate 60 vehicles but on this Wednesday afternoon few of the spaces have been claimed. When the proposed new town is built here the scene should be very different. Looking south from the footbridge at Shawfair station on 22 October 2015. Leaving Platform 2, having collected and deposited no passengers, is Class 158 DMU 158 869, the 16.08 departure for all stations (except Stow) to Tweedbank. One of the unmissable ramps to the footbridge is seen to the left. 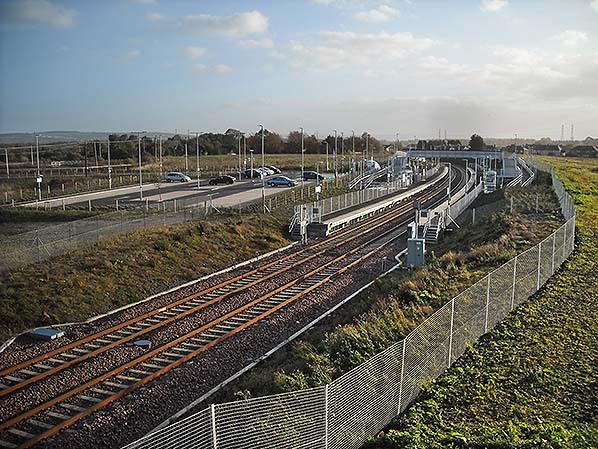 The ‘raw’ appearance of the station will be somewhat softened when the plants dotted about on the shallow cutting have matured, and the ubiquitous metal mesh fences will perhaps lose their prominence. A few houses may be glimpsed in the distance, but when the plans for the new town come to fruition some 4,000 houses will be built within easy access of Shawfair station. Shawfair station is see here looking south from the bridge on the approach road on the afternoon of Thursday 22 October 2015. 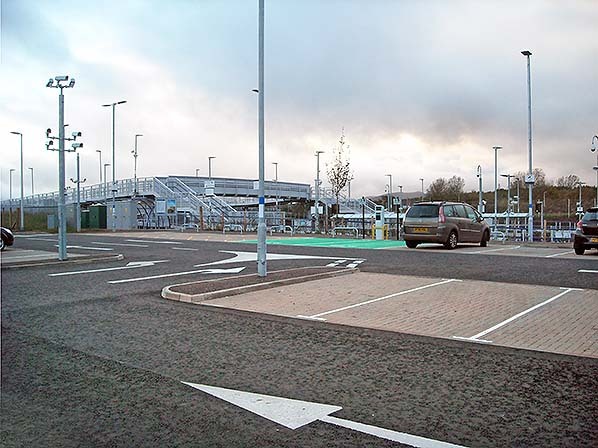 The lonely location of this station and its sparsely occupied car park are apparent, but when plans for the new town at Shawfair come to fruition this scene should be utterly changed; in future, at this time of day, commuters’ cars are likely to fill the car park. The station is on one of the ‘dynamic loops’ of the Borders Railway and thus has two platforms. 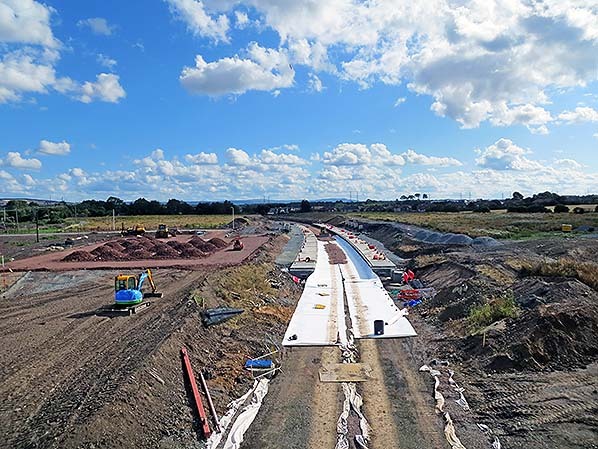 The footbridge and its lengthy approach ramps will be noted.